The Concert 88 Wireless Series by Samson is a professional wireless system designed for music and other presentations where speaker/vocalist freedom is a must. The frequency-agile Concert 88 Handheld allows for up to 16 systems to operate simultaneously across two frequency bands with up to 300' separating the receiver and transmitter. At the core of the system is the CR88 Wireless Receiver. Featuring a true diversity design, the CR88 minimizes signal dropouts during performance. If a dropout does occur, the CR88's tone key and auto mute functions eliminate any background noise until the signal is restored. The Concert 88 Handheld features the CH88 Handheld Transmitter with a Q6 Dynamic Microphone capsule. The transmitter, which can operate for up to eight hours on two AA batteries, is engineered to the finest detail to provide the ultimate in sound reproduction. 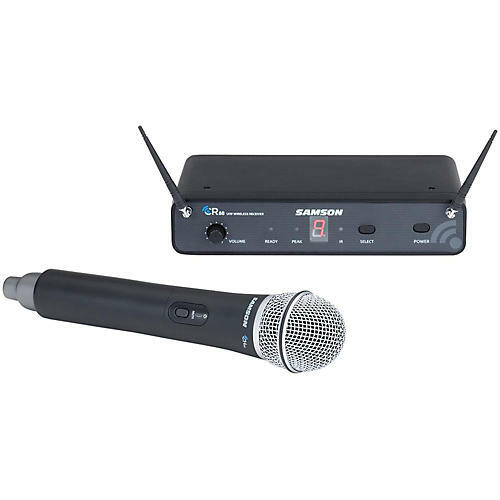 With Samson's Concert 88 Handheld Wireless System, advanced technology and total versatility combine to provide high-quality wireless performance wherever singers, business professionals, educators and others need it. Receiver: 8.25 x 4.9 x 1.75"